This summer, BTG(Bridging the Gap) led to BGT (Bringing Generations Together) at the Samvedna Activity Centre. As kids were off from schools during the summer break, we tried to bring together the experiences of two generations on one platform. 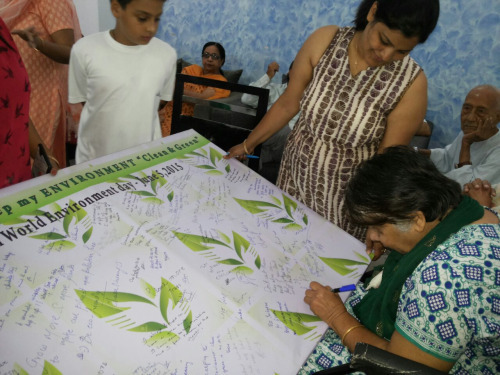 Various programs and activities such as a workshop on quilling, painting and art & craft, and World Environment Day celebrations were organized for the members. 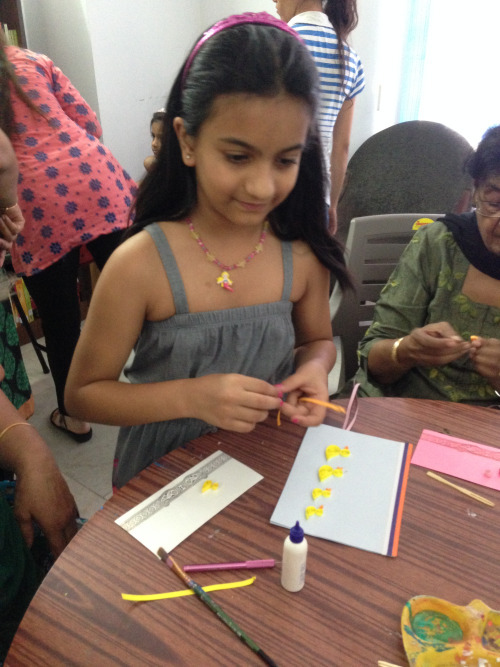 A young creative mind, Tamanna, conducted a session on quilling which is also known as paper filigree. It is an art form that involves the use of strips of paper that are rolled, shaped, and glued together to create decorative designs. The paper is rolled, looped, curled, twisted and manipulated to create shapes which make up designs to decorate greetings cards, boxes, jewelry etc. All the members took keen interest in the activity as it was a novel craft for them. They participated with keen enthusiasm under the guidance of the young ones – all under 14. The team motivated our members throughout the session in designing envelopes embellished with quilling for their grandchildren. Tamanna, along with her team, enjoyed conducting the activity. They also expressed their wish to join Samvedna, as the Centre and its activities amused and interested them. 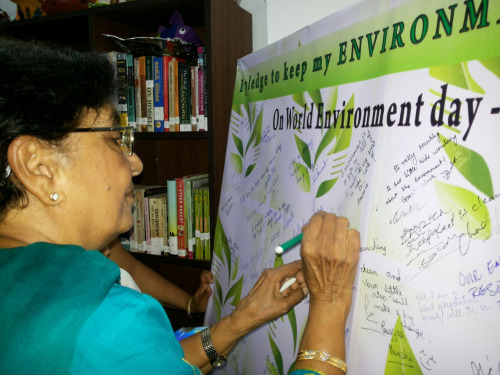 World Environment Day was observed with fervor at the Centre on 5th June. The event was marked by the voluntary collaboration by the kids of an organization called “Pure Hearts”. “Pure Hearts” is a group of children in the age group of 4 -16 who have come together to take up social and civic issues and to sensitize people and local authorities through their initiatives. The little stars of this organization conducted various activities for our members. They also sung a choir song – “Aashaein” which was heartily enjoyed and appreciated. 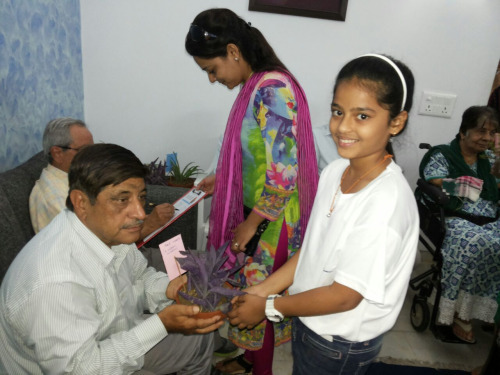 The children also distributed plant saplings to our members. 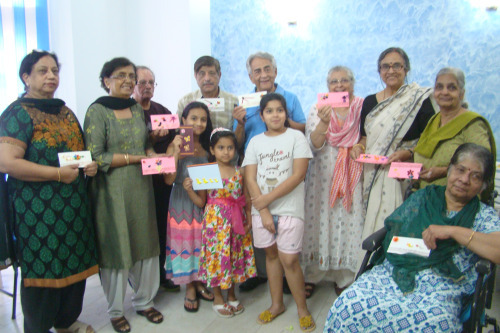 The seniors reciprocated by reciting and explaining a few verses of Sant Kabir’s popular “dohas” to the youngsters…an excellent give and take, and bonding between the generations. 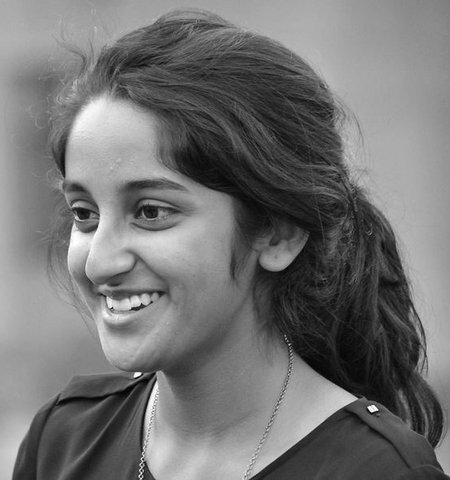 Tanvi, a 16 year-old who was interning at Samvedna during the summer also shared her experience. “Interning here for two weeks taught me the importance of listening. Just lending an ear to the elderly can make them feel special and teach you a lot. They’ve got a lot of knowledge to share – one only has to listen. I also learned the value of constant cheeriness, positivity and determination,” she said. These inter-generational interactions created a dynamic atmosphere at the Centre throughout the summer. 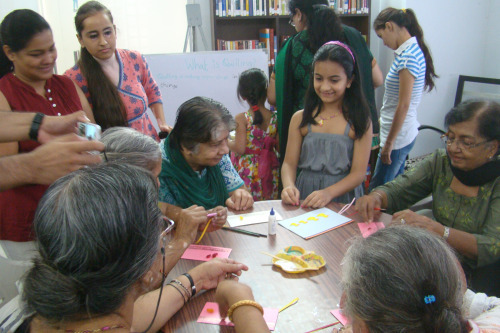 Members enjoyed each session with the children; and the youngsters left somewhat more sensitized towards the elderly. It was an enriching experience for all of us here at Samvedna as well. It was as though a rainbow had formed upon the convergence of the sun and the rain, both essential and life-giving, and each with its own unique predication.